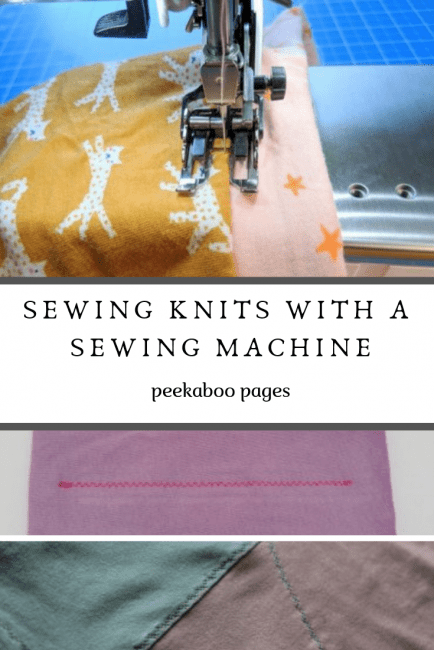 Sewing Knits With a Sewing Machine - Peek-a-Boo Pages - Patterns, Fabric & More! I love knit fabric, it is comfortable for everyday wear and I am surprised that it is in our wardrobe as much as 80% ! But I only have regular sewing machine, so can I still sew knit? The answer is YES ! You don’t necessarily need a serger to make a shirt or leggings . I had a sewing machine too when I was still crawling on four legs in the world of knit fabrics. My friends have also made beautiful garments for their family with just using a sewing machine. Some of them had hand-me-down sewing machine from their mother! I recommend that you read some of my tips here before you turn on the machine. Be sure to use scrap fabrics and practice before you cut the real fabric. You MUST get a proper needle meant for knit. There are different types of knit fabric and they all have different types of composition and stretch too. If you are working with jersey knit or fabric with less stretch then you will need ballpoint needle and when you are working with 4-way stretch fabric like swim fabric, then you will need stretch needle. Pay attention to the needle size too as they play big role too on the fabric. Now that you have insert the correct needle, time to do the threading. I use spun polyester thread and it works well. I always change to Teflon foot when it comes to knit fabric. Mine has a roller and it helps my fabric to move smoothly under the machine. Let’s move on to the stitches. You can’t use straight stitch just like you did with woven fabric. There are actually few stitches that you can choose on your machine like zig zag, triple stitch and lightning bolt stitch. Try these stitches and see which you like better. This is regular straight stitch and I use jersey needle size 80. No skipped stitch but see what happen when I stretch the fabric, it popped right away! I have two sewing machines. My main machine only has 20 types of stitches and has no lightning bolt but have zig zag and triple stitch. On the other hand my back up machine has 80 types of stitches! Number 29 is the picture of lightning bolt. The best thing about knit is that they don’t fray and you can leave as it is. Yay!! If you want your finished hems to have a professional look, just get a stretch twin needle and you ready to sew. This needle create two lines of straight stitches at the right side and zig zag at the wrong side, so that when you stretch the fabric the zig zag allow the fabric to stretch too. But if you don’t want to use twin needle you can choose decorative stretch as well. Who says you can’t use decorative on your knit project. It looks pretty especially on plain knit. Play around with the stitches on your machine and test which works the best on your fabric. For example in this project, I use decorative stitch letter J to topstitch and hem my plain shirt. It sure made my shirt looks stunning isn’t it. These are some of my guidelines using sewing machine to sew knit. I live in a country where it is impossible to get walking foot or Maxi Lock stretch thread easily ( unless I bought it overseas but I didn’t because I want to save money of course) . I learned a lot from my mistakes and practice for few months until I managed to sew successfully with these guidelines and I hope you find it helpful for your knit project.